Design Think — | The Style of D.C.
Andy Warhol’s 1967 screen print of Marilyn Monroe hangs in the National Portrait Gallery. Its design and color captured the iconic beauty and energy of the late actress. However, design thinking has a more permanent and purposeful meaning. Not only is this thought process useful in solving visual design problems; it’s now used as a way to foster innovative solutions for people daily lives. It’s a bold new calling card for creative thinkers and is valued as a framework for finding and solving problems. 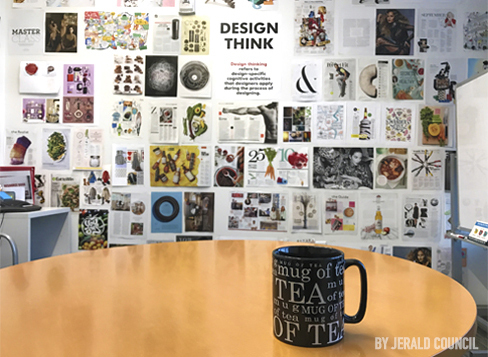 After the research stage is complete, design thinking is an effective tool for creating interactions and developing a responsive, flexible organizational culture, according to “Design Thinking Comes of Age” in the Harvard Business Review. The power to solve problems by using design principles extends beyond a traditional use of design. Companies such as PepsiCo have created chief design officer roles to promote design thinking throughout their organizations. At Pepsi, Mauro Porcini, senior vice president and chief design officer, is responsible for leading innovation through design. 3M, Apple, Procter & Gamble, Starbucks, Under Armour, and most recently automaker Daimler, also value the importance of this role. These top companies are integrating design into their business creation processes and inspiring innovation. My oldest son, a Virginia Tech graduate, double majored in electrical engineering and psychology. I didn’t get it at the time, but now I understand why and how studying the human mind and its behavioral functions complement his engineering degree. While an intern at Intel, he learned that simplifying complex gaming functionality could improve and provide meaningful experiences for end users. The inspiration room at Studio Gannett. Design thinking is less about aesthetics, but more about using consumer empathy and principles of design to influence the way people work, live, behave or feel. It requires freedom of thought on all levels. Conceptualization, prototyping, execution and delivery of an idea involve fresh thinking, cultural change and organizational acceptance. I am convinced that by implementing this process, design thinking will thrive in more industries. It will bring about a revolution in creativity that will fuel growth and originality, while embracing all aspects of human experience. creative leader + explorer + videographer and passionate anime fan.